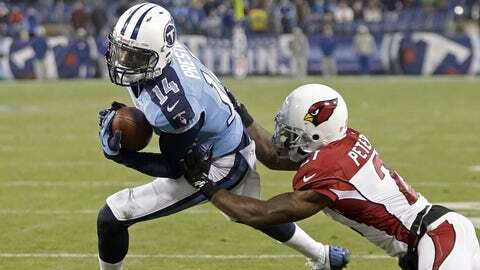 Titans receiver Michael Preston scored the game-tying touchdown against the Cardinals, forcing overtime on Sunday. NASHVILLE, Tenn. — With their playoff hopes barely surviving on life support, the Tennessee Titans fought long and hard before having their postseason plug pulled in a gut-wrenching 37-34 overtime loss Sunday to the visiting Arizona Cardinals. Down by 17 points with little more than 6 minutes to play, the Titans (5-9) mounted a furious rally to force overtime. But the Cardinals (9-5), who scored 21 unanswered points in the second half to stake the 17-point lead, got a game-winning 41-yard field goal from Jay Feely in overtime to keep their playoff hopes alive. "It’s hard to believe the things that have happened this year," said Titans coach Mike Munchak, whose team has lost eight of 10 games — including three in a row overall and five straight at home — since opening the season 3-1. Coupled with Miami’s win earlier in the day over New England to get to 8-6, the Titans were mathematically eliminated from the playoffs, a place the team hasn’t been since 2008. The loss also fuels the flames that Munchak might not return for a fourth season at the Titans’ helm. New team owner Tommy Smith, son-in-law of late owner Bud Adams, said he would use the team’s final games as part of that assessment. And Munchak, whose team plays at Jacksonville next Sunday before closing at home against Houston on Dec. 29, pointed to his players fighting back against the Cardinals to force overtime when all appeared lost in regulation. "This group is going to play hard, like they did and not give up, no matter what the situation is," Munchak said. "We have to win football games. We know that. I think everything gets taken into account — how these guys respond and how they’re playing out the year." Against the Cardinals, the Titans committed three costly turnovers that resulted in 13 Arizona points, while forcing none of their own. "It has been strange the way the ball has bounced against us in plays or plays made or plays not made," Munchak said. "It just seems like we’ve been finding a different way to lose games that we’ve had a great chance of winning. It comes down to making plays, as it always does." It appeared the Cardinals had put the game out of reach when cornerback Antoine Cason picked off a pass from Titans quarterback Ryan Fitzpatrick and returned it 20 yards for a touchdown and a 34-17 lead with 6:13 to play. "Oh, definitely," Cason said of thinking the game was over following his score. "When I intercepted the ball, what was going through my mind was score. Score, just get the game over with right now." But the Titans didn’t lay down after getting down by 17 points. On the ensuing possession, they drove the ball 67 yards on nine plays, getting a 14-yard scoring pass from Fitzpatrick to wide receiver Michael Preston to pull within 34-24 with 3:12 to play. After the conservative Cardinals were held on downs, the Titans drove from their own 22-yard line to the Arizona 6 before getting a 24-yard field by kicker Rob Bironas to pull within 34-27 with 47 seconds remaining. The Titans then covered an onside kick to get the ball at their own 47-yard line with 44 seconds remaining. After Fitzpatrick completed passes to wide receiver Kendall Wright of 26 and 20 yards, he hooked up again with Preston on an 8-yard scoring pass to pull the Titans within 34-33 with 10 seconds remaining. Lobbied by offensive coordinator Dowell Loggains to go for a two-point conversion to win the game in regulation, Munchak instead opted for an extra-point kick by Bironas to tie the game and force overtime. "I thought about it a lot," Munchak said of attempting the two-point conversion. "I just felt that we played so hard to get back in it to put it on one play, that all of a sudden the game is over.
" … Now, you sit here and think, ‘We might as well have done it. We had a better chance to win it.’ I felt the momentum was on our side." The Titans won the toss and took the ball first in overtime and drove to the Arizona 43 before Fitzpatrick was again intercepted by Cason. Seven plays later, Feely made the game-winning field goal as Arizona remained one game out of the final NFC wild-card playoff spot behind the Panthers (10-4) and 49ers (10-4), who both won today. "It’s hard to get a win on the road in the NFL, but we did," said Cardinals coach Bruce Arians, whose team closes with NFC West rivals Seattle on the road next Sunday and the 49ers at home in two weeks. "The goal was to get (win) No. 9," he added. "I got a little conservative and didn’t want to throw the football with a 10-point lead and wanted to use up their timeouts and thought we had enough defense to get it done, but it ended up in overtime." Despite the two costly interceptions, Fitzpatrick completed 36 of 58 passes for a career-high 402 yards, matched his career high with four touchdown passes, and posted a 91.3 rating. Wide receiver Kendall Wright had 12 catches for 150 yards, both career highs and game bests. Cardinals quarterback Carson Palmer completed 20 of 30 passes for 231 yards with one touchdown, no interceptions and a 100.8 rating. But the Titans outgained the Cardinals 460-360 in yardage, had eight more first downs (32-24) and held a slight advantage in time of possession (33:44 to 30:58). With the score tied at halftime at 10-10, the Cardinals opened the second half with a pooch kick that was muffed by Titans linebacker Patrick Bailey, who was an up man as a blocker on the return unit. After the Cardinals took over at the Tennessee 23, they were held on downs and settled for a 47-yard field goal by Feely and a 13-10 lead. Seizing momentum gained by the defensive stand, the Titans marched 74 yards on 16 plays for a 17-13 lead midway through the third quarter. On the drive, Fitzpatrick connected with Wright on a pair of third-down conversions and found tight end Delanie Walker alone in the back of the end zone for a 1-yard scoring pass, putting the Titans ahead at 17-13. But the Cardinals regained the momentum immediately, taking little more than 4 minutes to regain the lead at 20-17 with a seven-play, 72-yard drive. Palmer completed a 6-yard scoring pass to tight end Jake Ballard, but the big play of the drive was a 38-yard pass from Palmer to running back Andre Ellington. Arizona then stretched the lead to 27-17 with 6:50 remaining on a 1-yard run by running back Rashard Mendenhall. Palmer completed 5 of 7 passes on the drive, including an 18-yarder to wide receiver Larry Fitzgerald on a third-and-11 that kept the drive alive. "That’s a game we’re supposed to win," Fitzpatrick said. "For us to come back 17 points down like that, to win the toss (in overtime), get the ball, you know be at home, all that stuff.
" … It’s that the ending really scripted there, but unfortunately it happened." Titans wide receivers Justin Hunter and Damian Williams were declared inactive for the game Sunday because of violation of team rules. In three previous games, Hunter had emerged as an offensive threat, posting two games of more than 100 yards receiving. He was second on the team with four touchdown receptions.